Transcranial color-coded real-time sonography (TCCS) enables simultaneous and 2D visualization of brain parenchyma and intracranial blood vessels in color-coded B-mode images (1, 2). Therefore, this tool is a reliable method for the noninvasive assessment of the basal cerebral arteries, including not only anterior but also posterior brain circulation. However, the major limitation of TCCS is poor insonation of ultrasound in approximately 16–20% of patients (3, 4). Transpulmonary sonographic contrast agents can overcome this drawback because they increase the echogenicity of the blood with microscopic air bubbles. The agents can also improve the diagnostic capability of intracranial Doppler imaging (5–14). We described the diagnostic criteria of TCCS for occlusion and stenosis of the middle and posterior cerebral arteries (15, 16). However, the TCCS criteria for basilar artery occlusion have not yet been reported. The purpose of the present study was to assess the diagnostic ability of conventional and contrast-enhanced TCCS for patients with acute stroke and basilar artery occlusion. Sixty-two consecutive patients (54 men and eight women; age range, 46–90 years; mean age, 67.6 years; median age, 67.0 years; SD, 9.6 years) with acute ischemic stroke or transient ischemic attack were prospectively examined within 1 week after symptom onset with both conventional and contrast-enhanced TCCS between October 1999 and February 2000. Thirty-eight had ischemic stroke in the anterior circulation and 24 in the posterior circulation. TCCS was performed within 1 week of stroke onset (<6 hours in six patients, 6–24 hours in nine, 2–3 days in 29, and 4–7 days in 18). All patients underwent cerebral angiographic examination with digital subtraction angiography (n = 23) or MR angiography (n = 39). The intervals between ultrasonographic and angiographic examinations were <3 days. The patients were divided into two groups, based on angiographic findings: the basilar artery occlusion group (n = 7) and the non-occlusion control group (n = 55). Two investigators blinded to the angiographic results performed the TCCS examinations. All patients were placed in the right lateral position with the head flexed so that the chin rested on the neck. A probe was placed on the middle of the nape of the neck (suboccipital acoustic bone window) to aim the ultrasound beam upward through the foramen magnum. An Ultramark 9 HDI with a 2- to 3-MHz 90° sector scan was used for TCCS examination. Pulse repetition frequencies ranged from 2,500 to 10,000 Hz, depending on optimal visualization of the vascular structure. The color sonographic gain level was just below the level of the background noise. Blood flow toward the probe (positive Doppler shift) was shown in red, and blood flow away from the probe (negative Doppler shift) was shown in blue (2). We chose a coronal scanning plane that allowed simultaneous visualization of the bilateral vertebral arteries and the basilar artery in one scanning plane. The basilar artery was identified as a flow image distal to the vertebral union. If the vertebral arteries were displayed as only one flow image because of an occluded or aplastic contralateral vertebral artery, we judged that the basilar artery was visualized as linear flow at an insonation depth of approximately 70–100 mm. Soon after conventional TCCS, 4–8 mL of contrast agent (300 mg/mL; Levovist/Schering, Berlin, Germany) was injected within 10 seconds through the antecubital vein (17). We calculated the detection rate of basilar artery flow using conventional and contrast-enhanced TCCS and compared the rates using the χ2 test. In each basilar artery flow image, the direction of blood flow (toward or away from the probe) was also noted. Digital subtraction angiography with selective injection of the common carotid and vertebral arteries was performed via the femoral artery in all patients. MR angiography was performed by using a 1.5-T system (MAGNETOM Vision, Siemens) with the following settings: 35/7.6 (TR/TE); flip angle, 20°; section thickness after zero fill interpolation, 0.5 mm; matrix, 245 × 512; field of view, 17.5 × 20 cm; and superior saturation band. MR angiographic images were processed with a maximum intensity projection. Two neuroradiologists blinded to the results of the sonographic studies interpreted the digital subtraction and MR angiographic studies. The insonation depth was between approximately 60 and 80 mm for the vertebral union and >60 mm for the basilar artery in the control group. Normal antegrade basilar artery flow was detected by conventional TCCS in 42 (76.4%) patients. After contrast enhancement, the basilar artery was visualized in all except one patient (98.2%, P < .001 versus conventional TCCS). On the other hand, the basilar artery image could not be obtained with conventional TCCS in any of the basilar artery occlusion group patients. 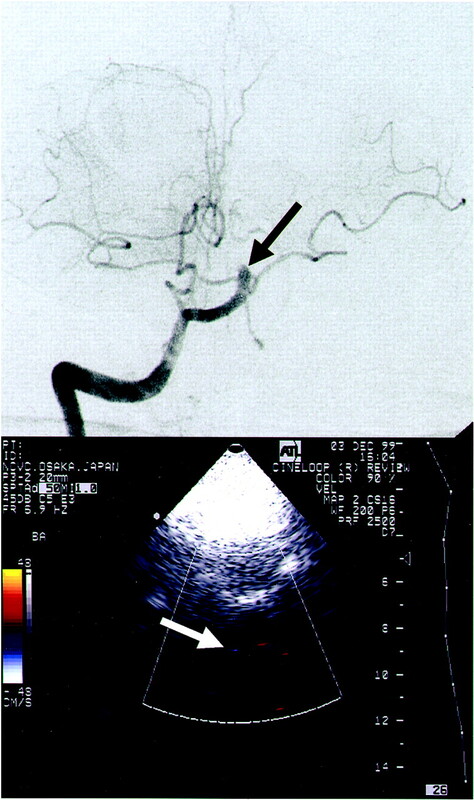 Using contrast agents, we detected a reversed flow (reversed basilar artery flow sign) in the distal basilar artery in five patients, who had a retrograde basilar artery filling via collateral circulation from the carotid system revealed by digital subtraction or MR angiography (Fig 1). The other two patients did not have the reversed basilar artery flow sign. Their angiograms showed occlusion of the distal basilar artery and did not show blood supply through collateral circulation from the carotid system (Fig 2). Anteroposterior view angiogram of the right vertebral artery shows distal basilar artery occlusion due to cardioembolism (top, arrow). No blood supply to the basilar artery was evident on the carotid angiograms (not shown). With contrast-enhanced TCCS, no basilar artery flow was visualized (bottom, arrow). Previous studies have indicated that contrast-enhanced TCCS enables adequate diagnosis regarding brain circulation, even when conventional TCCS is insufficient (5–14). The present study showed that conventional TCCS could visualize normal basilar artery flow through the suboccipital window in only 76.4% of the patients. However, contrast-enhanced TCCS detected 98.2% of the basilar artery flow in these patients. The sonographic findings were highly compatible with those of angiography. Therefore, non-occluded basilar artery was reliably diagnosed by contrast-enhanced TCCS. When normal antegrade basilar artery flow is not visualized with conventional TCCS, a contrast-enhanced study should be added to evaluate the presence of occlusion. If normal antegrade basilar artery flow cannot be imaged by contrast-enhanced TCCS, the presence of basilar artery occlusion should be strongly suspected. In patients with basilar artery occlusion, basilar artery flow imaged with contrast-enhanced TCCS varied according to the site of occlusion. We obtained the reversed flow in the distal basilar artery in patients with proximal basilar artery occlusion. In these patients, blood supply to the distal basilar artery was confirmed with digital subtraction angiography or MR angiography via collateral circulation from the carotid system. Conventional transcranial Doppler sonography is a noninvasive method for studying the vertebral and basilar arteries. However, the procedure has several difficulties: identification of a target artery under pathologic conditions, unknown isonation angles, and documentation. It is often difficult to distinguish the basilar artery from other arteries, such as the vertebral, anterior inferior cerebellar, and posterior inferior cerebellar arteries. TCCS is superior to transcranial Doppler sonography in evaluating the vertebral and basilar arteries because TCCS can display color flow images of these major vessels. There are some potential problems related to the application of TCCS in the evaluation of patients with stroke. First, although this procedure is noninvasive, useful application of this technology is likely to require the availability of experienced operators during initial assessment of the patients. Second, it seems unlikely that contrast-enhanced TCCS will replace CT-assisted angiography or MR imaging supported by perfusion/diffusion sequences and MR angiography for initial evaluation of patients with stroke leading toward inclusion or exclusion from thrombolytic therapy. However, contrast-enhanced TCCS could be useful for making a treatment decision when patients with acute ischemic stroke and basilar artery occlusion are admitted or transferred to a hospital where digital subtraction or MR angiography cannot be performed. Third, there are some diagnostic limitations of the imaging technique, such as difficulties obtaining a proper sonographic window, the effect of obesity, variations in vessel morphology, and the effect of significantly reduced blood flow velocity. Contrast-enhanced TCCS visualizes basilar artery flow better than does conventional TCCS. As examined with contrast-enhanced TCCS, the combination of lack of antegrade basilar artery flow imaging and the reversed basilar artery flow sign may be diagnostic of proximal basilar artery occlusion. We thank Dr Naoaki Yamada (Department of Diagnostic Radiology) for valuable comments regarding MR imaging studies. This work was supported in part by the Research Grant for Cardiovascular Disease (12A-2) from the Ministry of Health and Welfare of Japan and by the Special Coordination Funds for Promoting Science and Technology (Strategic Promotion System for Brain Science) from the Science and Technology Agency of Japan. This work was presented in part at the 4th World Stroke Congress, Melbourne, Australia, November 25–29, 2000.